Four (and a half! )-year-old Tim asked me curiously. He and younger brother Teddy were looking at me intently. I resisted the urge to glance down at my shirt to see if my stomach was pooching through. I wanted very badly to answer affirmatively, but didn’t. Instead I turned the questions around on him (Journalism training ftw). As it turns out, Tim had a 29-year-old son named Caleb and Teddy had a 22-year-old son named Penny (his mom’s name). Tim asked if Caleb was older than I and I assured him he was. I’m not at a point in my life where I feel the need to be set up with imaginary boyfriends. Especially when the father is so nosy about the state of my tummy. 1) CHEAP stuff. Not just knickknacks: restaurants, accommodation, grocery stores. My Thai main course at one of the beach restaurants was 80 Baht (less than $3.00). Our double room (spacious with bathroom) was $25 a night (per person). 2) FOOD everywhere. Everywhere. At one of the giant malls I went to, every floor had some form of food court (international food court, Thai food court, random food stalls, grocery stores etc.). There were at least eight floors. 3) Fresh fruit. Yummy, cheap, in all the stalls. 4) Roti. This is a thin Indian bread that can be found at outdoor stalls in Bangkok and Koh Samet. They cook it in front of you and top it with deliciousness. My favorite topping was sweetened condensed milk. 5) Sunshine. I imagine it can be unbearably hot during the summer, but Thai winter weather is perfect, especially if you’re visiting from the icy tundra (Sweden). 80 degree January? Yes please. 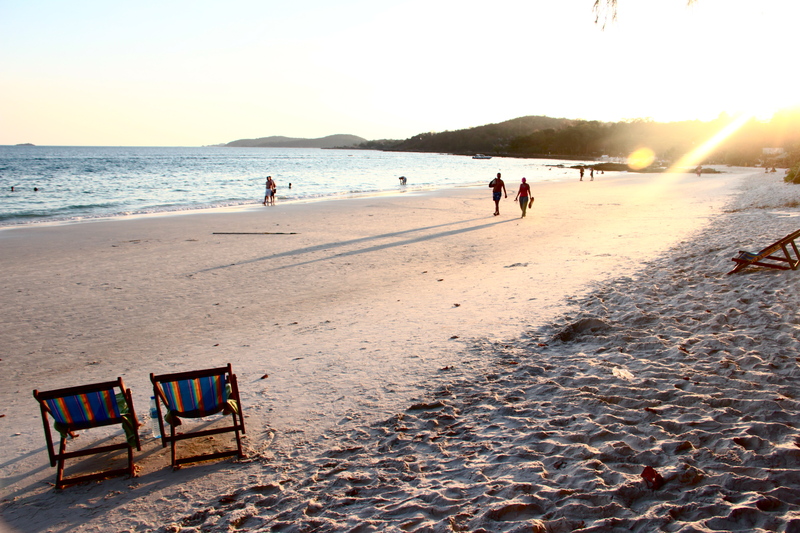 While I enjoyed all of these things about Bangkok, Koh Samet had its own particular charms. White, soft beaches with vividly blue water. Vendors wandering the beaches with henna tattoos, sarongs, souvenirs, fresh fruit, meats, etc. Nightlife that is extremely affordable and relaxed. Affordable: No entry fee, crazy deals on drinks (flip a coin to see if you pay or not). Relaxed: jean shorts and tank tops. People wandering in and off from the beach. The one visual mar on the whole experience was the plethora of large European men in tiny speedos. Natalia and I discussed this eyesore at great length. Our conclusion: Neither of us has ever met a female who finds speedos attractive. Girls don’t work like that. I am not sure who created the concept of using a tiny piece of stretchy material to cover your special area. I know that there are probably many reasons for wearing a speedo: better tan lines, faster swimming, etc. However, if you are wearing yours because you think women find it attractive to see such a barely hidden display of your bits, you are mistaken. Women have varied physical tastes when it comes to men: some like hairy chests, some like bare. Some like tall, some like short. Some like skinny, some would prefer a little extra. BUT, I have never met a woman who finds speedos attractive. In fact, we generally find them repulsive. Perhaps, as a man, you think that because you prefer less to more, women feel the same way. We don’t. Even if you have Matthew McConaughey’s body, we don’t want to see your area bulging like badly packaged meat in saran wrap. Please stop assaulting our eyes. P.S. Animal print is NEVER alright. Men at grocery store in Koh Samet. Love it, thanks for the laughs! It’s funny ’cause the boy in that picture with the most pleasing figure is wearing long shorts! Good man! Badly packaged meat indeed! I totally started cracking up at this. I can’t wait to visit Natty in Thailand and see all these wonderful things!! Oh, and by that I mean everything BUT the men in Speedos, in case that was confusing because of my sentence placement. I think that women are really the ones that want to decide what men wear. Keep your bikinis I don’t care just give us back our speedos. Don’t like it don’;t look!